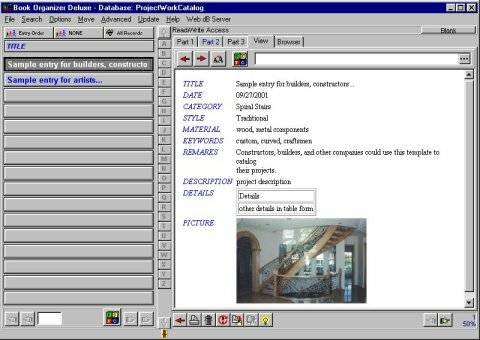 Project/Work Catalog: complete template that allows constructors, builders, artist, and all craftsmen to catalog their work. You can organize and track the following data: project/completed work title, date, project category, work style, material used, keywords, notes, details, picture, and more. You can easily organize all your information about your projects. You can process your data in a variety of ways: quickly find information, print reports and catalogs, create catalogs in HTML form, and more. You can customize the project/work database or create a new one.